When you are arrested in Arizona then you have the right to appear in front of a Judge within twenty four hours of your arrest. If you were arrested on a Friday or on a holiday then you have a right to appear in front of a Judge on the next business day. The first time you appear in front of a Judge you will either be released on personal recognizance, given a bail amount that must be paid prior to release, or denied bail. While most cases that involve bail are standard, there are times in which a Judge may be on the fence about setting bail. 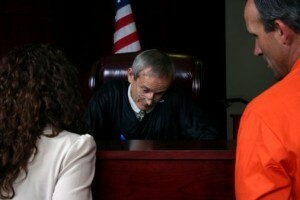 There are also release conditions that will always accompany bail. If you are at risk for being denied bail, or if you believe your bail or release conditions are unfair, it is important to hire an attorney right away. Contact the Barber Law Group today for more information. During your bail hearing our attorney will present an argument for why you should be allowed to wait for your trial to proceed from the comfort of your own home. Possible reasons he may cite include strong ties to the community such as friends, family, and church, long-term employment and evidence of stability, lack of means to leave the area, a lack of past criminal record, and recommendations from respected members of the community. If you have been arrested for a serious crime then it may take months before your trial begins. It is much easier to prepare oneself for trial and to deal with stress from home than it is from jail. Contact Bretton Barber today to speak with a lawyer. In addition to Phoenix, our attorney represents defendants in other Maricopa County cities such as Mesa, Glendale, Scottsdale, Chandler, and Gilbert. We also assist Pima County residents in Tucson.